Publishers of sci-fi, fantasy, and mystery. 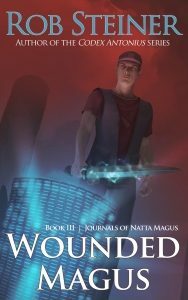 WOUNDED MAGUS is the sequel to SHADOW MAGUS, and book three in the Journals of Natta Magus series, by the author of the Roman sci-fi/alt-history Codex Antonius saga. This entry was posted in alt-history, CITIZEN MAGUS, Natta Magus, novels, SHADOW MAGUS, WOUNDED MAGUS on June 9, 2017 by ancile. Marcus Antonius Primus began a golden age for humanity when he liberated Roma from Octavian Caesar and became sole Consul. With wisdom from the gods, future Antonii Consuls conquered the world and spawned an interstellar civilization. Three weeks before the millennial anniversary of the Antonii Ascension, star freighter captain Kaeso Aemelius, a blacklisted security agent from Roman rival world Libertus, is asked by his former commanders to help a high-ranking Roman official defect. Kaeso misses his lone wolf espionage days – and its freedom from responsibility for a crew – so he sees the mission as a way back into the spy business. Kaeso sells it to his crew of outcasts as a quick, lucrative contract…without explaining his plan to abandon them for his old job. But Kaeso soon learns the defector’s terrifying secret, one that proves the last thousand years of history was built on a lie. Can Kaeso protect his crew from Roman and Liberti forces, who would lay waste to entire worlds to stop them from revealing the civilization-shattering truth? 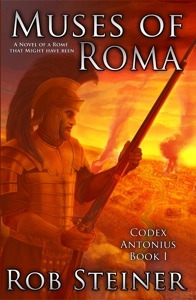 MUSES OF ROMA is the first book in the exciting Codex Antonius trilogy. This entry was posted in alt-history, Codex Antonius, MUSES OF ROMA, novels, science fiction on May 14, 2017 by ancile. 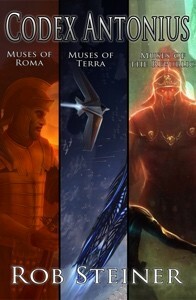 MUSES OF TERRA is Book Two of the Codex Antonius and sequel to the exciting sci-fi/alternate history novel MUSES OF ROMA. 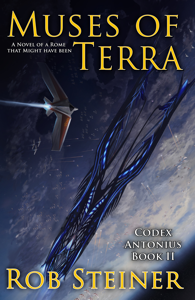 This entry was posted in alt-history, Codex Antonius, MUSES OF TERRA, novels, science fiction on May 14, 2017 by ancile. MUSES OF THE REPUBLIC is the exciting sequel to the sci-fi/alternate history MUSES OF TERRA and the final chapter in the Codex Antonius series. 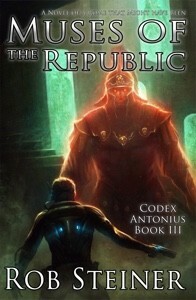 This entry was posted in alt-history, Codex Antonius, MUSES OF THE REPUBLIC, novels, science fiction on May 14, 2017 by ancile. In a universe where the Roman Empire survived and spawned an interstellar civilization, Marcus Antonius Cordus fights to free humanity from enslavement by a merciless alien intelligence that has watched humanity since its beginnings. Now you can get all three volumes in the Codex Antonius series (MUSES OF ROMA, MUSES OF TERRA, and MUSES OF THE REPUBLIC) in one low-priced ebook. This entry was posted in alt-history, Codex Antonius, MUSES OF ROMA, MUSES OF TERRA, MUSES OF THE REPUBLIC, novels, science fiction on May 14, 2017 by ancile.